Call it familiarity of the trails, or perhaps, relentless training and unmatched endurance, Bohol and Cebu Bikers each took two championship posts in four age group categories in the very successful Bike ta Bai’s Epic Challenge 2018. 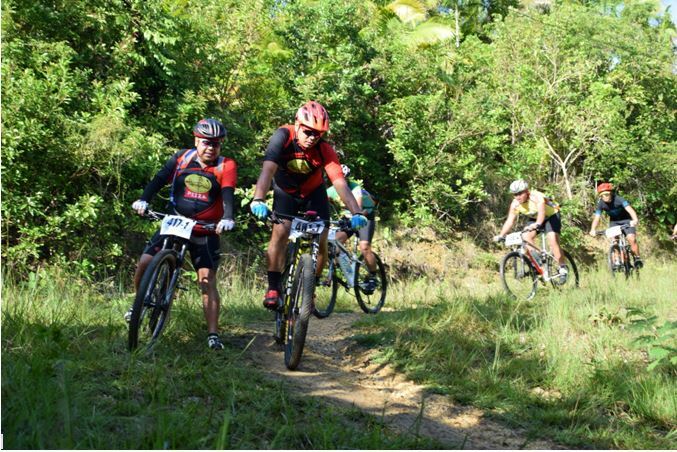 Boholanos from Paseo de Loon took the Elite and 40-49 age group championships while Cebuano bikers from Salt+Fin and MedTrek Team completed the top four most coveted posts in Bohol’s first distance and endurance mountain bike challenge November 25, 2018. Not really intent on giving up the bragging rights as the kings of epic distance mountain biking, Boholanos showed world-class extreme biking skills to keep Cebu bikers from sweeping the categories and reign supreme in the recently capped Epic Challenge 2018. Boholano elite biker pair of NichoLumay (Batuan) and AdelinoBuligan (Calape) and team mates Jonathan Pagaura and Ernesto Garcia from Paseo de Loon Elite Cycling Team worked as a team never really outdistancing each other to motivate as well as guide the spent racer back into recovery pace to grab the top two positions in the race. Lumay and Buligan, in racing number 09-1 and 09-2, crossed the line in spectacular fashion after taking turns in taking the lead to finish the grueling 85 kilometer route that winds through the killer climbs of five towns, in an aggregate time of 4:11:52.61 seconds averaging a nearly impossible 20.68 kilometers per hour. Third to cross the line were Cebuanos from Salt+Fin team with LitoBelarma and Roger Niere, who were champions in the 39 and under category, the pair registering a 4:15:25.87 finish. Fourth to cross the line and coming in second on the 39 and under category are CebuanosJohn Paul Juson and JhepPoyJuson who clocked in at 4:27:20.02. Coming in fifth over-all and hailed as Champions for the 40-49 age group are Boholanos of the Paseo de Loon Team with Rogelio Torreon and Roberto Saniel, who crossed the line at 4:29:04.93. Roughly a minute later came Pathfinders Multi-Sports team of Cebu who crossed sixth over-all as Paul Ryan Lucero and RedanCantilla came in third for the 39 and under category with a combined time of 4:30:24.16. Over thirty minutes of lull, barged in seventh over-all and grabbed the second place for the 40-49 age group were Butchie Zamora and Glenn Flores of TriBohol at an aggregate time of 5:05:15.76. Eighth in the over-all pair of arrivals after non stop bike pedal cranking third placer for the elite category; Cebuanos of the Team Big Ring Race and Adventure: MetchelPilapil and JezamBaldomar, who clocked an aggregate of 5:05:58.66 seconds. Tenth overall and hailed as Champions in the 50 and above ager group were Cebuano bikers Renato Fuentes and Francis Solatorio of team MedTrek who both garnered a combined time of 5:18:17.94. In eleventh place over-all are Boholanos of the Bohol BikeKings Feliciano Perez and GodofredoAlbuladoracoming in with an aggregate time of 5:50:32.22, which earned for them the 2nd place for the 50 and above age group. Meanwhile, in the twelfth place over-all were Boholanos of the Bohol Bikers Club tandem of VenancioAmora and ConcordioBernales who had a combined time of 5:58:58.15. “They should have exercised restraint during the race considering the distance alone,” commented BtB Epic technical consultant JojoOcullo, who along with BtB members, plotted the 85++ kilometer race course that would take the riders through barangay roads and trails of Maribojoc, Antequera, San Isidro, Calape and Loon and traverses across the mountains that are not promising to give a biker a painfully slow ascent, but leaving their throats parched as sandpaper. Organized by BtB as the first distance extreme mountain bike race in Bohol, “the Epic Challenge has, as advertised, a race and a test in self-sufficiency where a biker would have to use his prudence to supply himself with enough provisions for him to finish and conquer the race,” remarked organizer Gerry Marmito, who always considered the success of the race as a team effort and because of the support of the local government units of the traversed towns, their race volunteers and the great weather that lasted during the most crucial time of the race. Participated in by bikers from as far as Mindanao, Bacolod and Ilo-ilo as well as joined in by foreign endurance mountain bike enthusiasts, the Epic Challenge had most bikers on the verge of giving up on the killer climb segment from Loon town to Tan-awan and the equally tricky technical sections of JandigMaribojoc. “Truly Epic. Wonderful route with a killer last climb. Well signposted throughout (loved the orange ribbons). This was one of those very few days when I really felt “alive”. Great meeting fellow bikers & admiring their wheels,” Bamford who came in with his wife from Tacloban said.